Researchers unfamiliar with mouse genetics can be confused by complex strain nomenclature, leaving them unsure how to select controls for a particular test strain. The nomenclature of congenic mice records a wealth of useful information, including both donor and recipient strains and mutations of interest. One common example of this is confusion around background strain for GEM and mutant lines. While it is common now to make a desired mutation directly in a strain of interest - such as the popular C57BL/6 (B6) inbred strain -- during the early days of murine genetic engineering, most mutations were made on backgrounds chosen for their ease of genetic manipulation and not necessarily for their value as a strain of interest. For example, many mutations were made in embryonic stem (ES) cells derived from the 129P2 inbred strain, which produced robust ES cells. But researchers preferred to study those mutations on the B6 background, not the 129P2 background. So how can those mutations be transferred to a new strain? Mutations of interest can be moved from one background strain to another through backcrossing, which generates congenic mice primarily derived of the recipient background - B6, for example - containing the mutation of interest and a linked section of its chromosome derived from the donor strain. 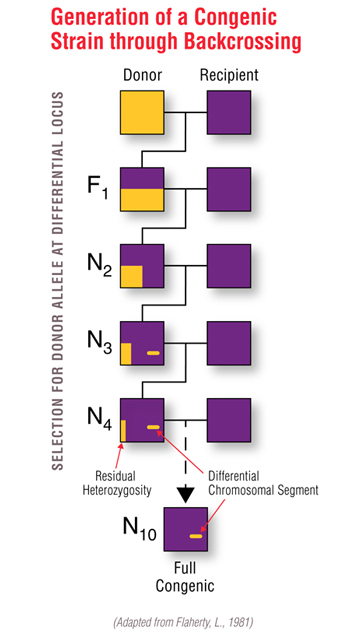 Repeatedly mating the donor to the recipient strain and selecting for offspring with the desired mutation, typically through genotyping, removes ~50% of the donor genome with each successive generation. Five generations of backcrossing will produce a line ~94% derived from the recipient genome. Five generations is the minimum number of crosses to generate a congenic mouse model. At the tenth backcross, approximately 99.9% of the genome is derived from the recipient strain. While traditional backcrossing is still used, this process can be accelerated via selecting breeders in each backcross generation which have the highest percentage of recipient genome. This is commonly called speed congenics. All of this background information is encoded in congenic strain nomenclature, allowing informed researchers to rapidly assess the utility of a given rodent model to their precise area of study. For example, consider the RAGN12 model. The original Rag2 knockout mutation was made in CCE ES cells derived from the 129S6 inbred strain. The resulting mutant mice were on the 129S6 background. As researchers wanted to be able to study this mutation on the popular B6 background, the line was backcrossed 12 generations to C57BL/6NTac to make a congenic strain. Over 99.9% of the genome of the RAGN12 line is derived from the C57BL/6NTac inbred strain, with some small residual genome contribution from the 129S6 strain, primarily flanking the Rag2 mutation. "The Rag2 mouse was developed in the laboratory of Frederick W. Alt at Columbia University. The model was created by targeting the Rag2 gene in CCE ES cells and injecting the targeted cells into blastocysts. This line originated from model RAG2-M on a 129S6/SvEv background. The mice were backcrossed twelve generations (N12) to a C57BL/6NTac inbred background. Heterozygotes were intercrossed to generate homozygous targeted mutation mice. The line is maintained by incrossing homozygous mice." If you stopped at "The model was created by targeting the Rag2 gene in CCE ES cells and injecting the targeted cells into blastocysts. This line originated from model RAG2-M on a 129S6/SvEv background." you might assume that this line was on a 129S6 background. Researchers familiar with congenic strain nomenclature, on the other hand, get the full picture at a glance. Wild type controls for GEM mice should be as close as possible to the GEM line of interest in terms of background genetics. For congenic lines where both wild type and transgenic mice are produced from the same matings, the wild types produced in that manner are often the best controls. Many GEM lines are maintained via matings of homozygous females and males, however, meaning no wild type littermates are produced. In that case, a review of the nomenclature and origin is in order to determine the best wild type control. As an example, let's look at the CETP line: B6.SJL-Tg(APOA-CETP)1Dsg N11. "The CETP mouse was developed in the laboratory of Dr. David Grass at Xenogen Biosciences, now Taconic. The model was created by microinjecting the human CETP gene into (C57BL/6J x SJL) F2 zygotes. Taconic received stock in April 1996 at the second backcross from the founder line. The mice were then backcrossed one generation to C57BL/6 prior to intercrossing for homozygosity. Backcrossing to C57BL/6NTac recommenced at Taconic in 2004. The line was backcrossed a total of 10 generations (N10) and then intercrossed to homozygosity. A homozygous colony is maintained for the production of hemizygotes through mating to C57BL/6NTac (N11)." The origin indicates the line was backcrossed to C57BL/6NTac, making that inbred strain the most appropriate wild type control.